There’s been a long battle over the years when it comes to instant messaging. In the beginning, there were desktop apps like AIM, Yahoo IM, ICQ, MSN Messenger, etc. Then there started being a shift to video and voice chat with apps like Skype. Now, in the mobile age, there’s a whole new playing field. Skype is available for video/voice messaging on most smartphones, but then there’s apps like Kik, WhatsApp, Tango, and some others. One of those is Viber, with about 200 million users. 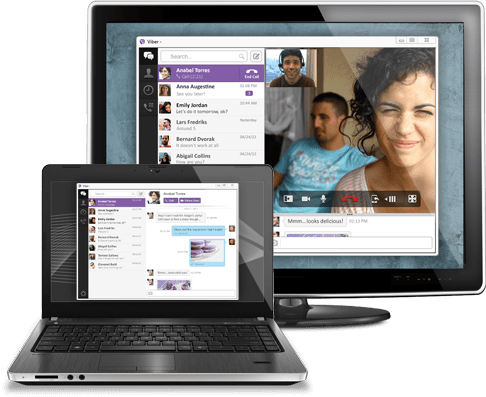 Today, Viber announced its desktop app for Windows and Mac. This is the first time one of these mobile IM clients has come to the desktop. They’re looking to compete with Skype and Facebook Messenger, which are the two most popular at the moment. The new desktop app will keep your IMs in sync across all platforms. They’ve released v3.0 for Android and iOS. Updates are coming for Windows Phone and Blackberry. You can download the new desktop version at Viber.com. For the mobile versions, check your app store for updates. Good to see Viber competing against the big boys. Thanks for posting. I agree! Although I don’t know many people that use Viber, Kik, or WhatsApp, its good to see them expand over to the desktop. Windows 8 might help them too if they can eventually port over their Windows Phone versions to Metro-UI in Win8.